Cardiac computed tomography (CT) radiation dose has gotten a lot of scrutiny recently. And one of the most recent representative papers is a multicenter study that showed that the radiation dose in cardiac CT is relatively high compared with other applications.1 There were also quite a wide range of medians for study doses observed across many different participating sites, the mSv value ranged from 4.6 to 30 mSv. I will discuss three synchronization techniques for cardiac CT angiography (CTA): Prospective triggering (step and shoot), retrospective gating (low-pitch helical) and prospectively triggered high-pitch helical (only available on our dual-source scanner). 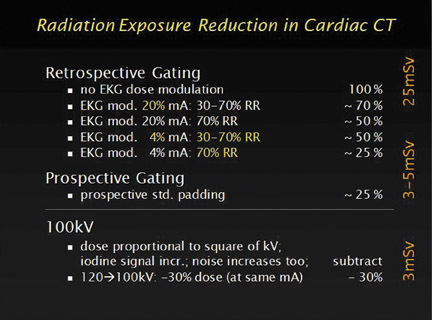 To sum up, prospective gating triggers the beam at every other peak in the RR interval (80 ms to 175ms) and there is minimal-to-no radiation dose overlap but the technique requires a slow and stable heart rate. Retrospective gating uses redundant helical data acquisition (table pitch ~0.2), it is coregistered with the electrocardiogram (EKG) and we select only projection samples that fall into the desired phase of the cardiac cycle. Some points on terminology: When we look into the EKG, the RR interval is the percentage of the R interval that defines the cardiac phases, particularly late systole, which is usually near 30% of the R interval, and diastole, which is usually near 70% or 75% of the RR interval. Also keep in mind that the diastolic phase shortens much faster for patients with high heart rates. It shortens much more so than the systolic phase shortens. The higher the heart rate, the more you should consider imaging in the systolic phase. This is important because it affects how we select our gating techniques, and also our dose-reduction strategies. Prospective triggering works by synchronizing the scanner with the EKG. So the scanner looks at the RR peaks and will scan and acquire data at every other RR peak. The data are reconstructed similar to any other step-and-shoot acquisition. 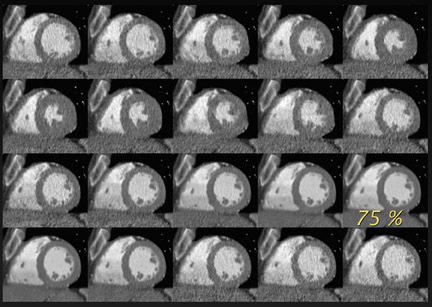 With a 64-channel CT, the scan time is about 5 sec to 7 sec, depending on the size of the scan range. Step-and-shoot is approximately as fast as helical acquisitions, but it uses substantially less radiation dose, which is a result of the prospective triggering. The dose is usually in the range of 5 mSv, although some papers report as low as 2 mSv to 3 mSv for prospectively gated coronary CTA. One limitation of prospective triggering is that you cannot use it all the time. It can only be reliably used if the patient has a low, steady heart rate, usually 60 beats per minute (BPM). We use 60 BPM as our cut off and we do not use step-and-shoot acquisition for anything +/- 5 BPM of the cut off. The other limitation is that you do not acquire dynamic information from this study. Our clinical experience with prospective gating is very favorable. When the heart rate is low (we use beta blockers to lower the heart rate appropriately), usually the image quality is very reliable in most clinical situations. Retrospective gating was more commonly used in the past and this is the technique that brought a lot of the bad reputation in terms of dose to cardiac CT. The dose penalty is a result of the way data is acquired. As a comparison, when we perform body CT we use a pitch of 1, which means that the table translates to about the same width as the collimation of the entire detector, but with cardiac CT we do not advance the table as quickly, which results in the over-scanning, or over-radiation of the patient. So we acquire a lot of redundant data. We do this because we want to retrospectively pick, from those redundant data, only those phases that we use to reconstruct images, which would make it seem like the entire data set was acquired in the diastolic phase for example. So the redundancy of data acquisition enables the phase-selective reconstruction, but it also increases the radiation dose. In the old days, it took maybe 30 sec to acquire a cardiac scan, but now we can acquire the same scan in about 5 or 6 sec. The benefit to having all of that redundant data is that you can reconstruct any phase of the cardiac cycle. Since scanners today have a much better temporal resolution, we can see the cardiac cycle in 20 phases with high detail of the aortic valve and the mitral valve. When we want to evaluate the valves, having this information throughout the cardiac cycle is necessary. Now, the redundant helical data acquisition, which is the cause of the high radiation dose of EKG retrospectively gated CT is really the underlying problem. Attempts have been made to diminish this problem by using EKG modulation. In principle it is a very good idea. It started out by just modulating the tube current, so instead of having it on at 100% the entire scan, we would down-modulate it during those phases of the cardiac cycle, where we probably will not reconstruct images and we would up-regulate it during maybe the diastolic phase. For patients with high heart rates, and in whom we want to acquire end-systolic or end-diastolic images, we had to operate the tube currents between 30% and 70%. These modulation techniques contributed to a decreased radiation dose. In the past you could only do EKG modulation if the heart rate was regular, because when you up- and down-regulate tube currents, you do so depending on the information of previous RR peaks. If the heart rate is irregular, it was possible that the dose would be insufficient during some of cardiac phases. New versions of EKG dose modulation have more refined methods, which actually look longer into the RR phases or R peak intervals. They can react, and not down-modulate or up-modulate, depending on the patient’s heart rate. This functionality is available on our dual-source scanners. Of course, you get an even more efficient scan if you down-regulate the tube-current to 20% or 25% and if you down-regulate them even lower, to say 4% it is almost like shutting it off. So if you have only the diastolic phase of tube-current turned on, and you down-modulate the current to 4% in the non- diagnostic phase, your end result looks very similar to a prospectively gated scan. This allows us to substantially reduce dose. Figure 1 is a graph that shows the dose ranges of retrospectively and prospectively gated scans. In clinical practice we usually use retrospective gating with our dual-source scanner. We use CARE Dose 4D (Siemens, Malvern, PA), which is an alternated tube-current modulation. The EKG modulation uses a “min-dose” that is 4% of the maximum mA in the nondiagnostic phase for heart rates &le;65 BPM we use a pulsing window with a 70% modulation over the RR intervals. For heart rates &ge;65 BPM we use a pulsing window with 30% to 70% modulation. If the heart rate is low, we can pulse only during the diastolic phase. If the heart rate is higher, we pulse from late systolic to the diastolic phase. For patients weighing &le;65 kg we deliver about 100 kV. If we require detailed valve function/morphology, we use EKG modulation at 20% of maximum mA with a 30% to 70% modulated RR interval. Figure 2 is a case where we had the highest dose that we have observed in clinical use of coronary CTA. This was due to the fact that the patient had atrial fibrillation, and the patient was on the heavier side. The heart rate was 32 BPM to 115 BPM. Despite the use of EKG pulsing, it was hardly ever triggered because the scanner automatically refused to down-modulate because it noticed that the heart rate was so irregular. We ended up with almost a 27 mSv scan. The quality of the scan is quite striking. Figures 2B and C are dynamic reconstructions that show that the atrium does not move. There are moderate artifacts here. But it turned out that, despite these difficulties, we always would be able to find one or another phase in this data set, where we could get diagnostic images of all aspects of the coronary artery tree. That is ultimately what you really want to have. If you expose a patient to such a high radiation dose, you at least want to have a diagnostic study. On the other end of the spectrum, Figure 3 is an example of an extremely low-dose case. This patient was 56 years old and weighed 60 kg, and his heart rate was 48 BPM. This heart rate was amenable to a more dose-efficient technique. So, in this case, we used min-dose retrospective gating and we used 100 kV only, which also substantially reduced radiation dose. The images in Figure 3 were acquired at a factor of 10 less dose than those in Figure 2. The quality is very nice and you can clearly see the soft plaque with some calcification in this patient’s LAD (inset image, Figure 3A). I also present the 20-phase view (Figure 3B). In order to obtain this, we reconstruct 2 mm fixed sections with a low-resolution matrix. This allows us to obtain diagnostic images throughout the cardiac phase, and it gives us the ability to perform functional imaging. Figure 3C is several views of the three-chamber, two-chamber, four-chamber, and short-axis heart. So even with 4% of the maximum dose, you can still get functional images. With our next-generation dual-source scanners, we are intrigued by the possibility of using a much larger pitch, instead of the pitch of 1.5 that we use now, to fill in the gaps of raw data by using the second X-ray tube. This also means that you can acquire these data very quickly—in about a 1-mile-per-hour table translation speed. This will become the fundamental new way of acquiring cardiac scans. It is not retrospective gating and it is not prospective gating, it is prospective helical acquisition with a very fast pitch. This type of acquisition has the potential to reduce dose even further than what we have achieved today, because it does not acquire any redundant data. Comparing this with our current, first-generation dual-source scanner, we envision obtaining the same image quality at a significant dose reduction for patients with low, regular heart rates. We know that all of the CT vendors are working on hardware and software systems to reduce radiation dose for cardiac CT, and we all are looking forward to that. 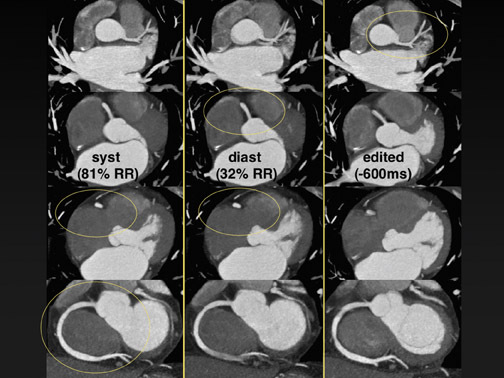 We already have effective dose-reduction strategies for cardiac CT, there will be even more effective techniques available in the near future. These techniques will be enabled by high-pitch acquisitions, by new detector designs, and by new reconstruction algorithms. It will still be imperative that we select the dose-reduction strategy based on individual patient factors like size, heart rate and clinical indications. The vendor community also needs to give us a better, automatically adjusted method of selecting mA and kV relative to patient anatomy; because, currently, this is not as ideal as it already is, for example, for other body applications, where we have auto-mA or automatic tube-current modulation techniques. In the near future, the benefit-to-risk ratio will be even more favorable than it is now. Hausleiter J, Meyer T, Hermann F, et al. Estimated radiation dose associated with cardiac CT angiography. JAMA. 2009;301:500-507. 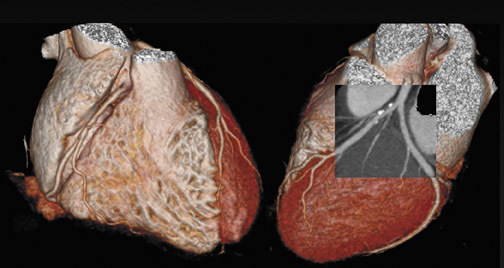 Practical dose reduction strategies in cardiac CT: The radiologist&#39;s perspective. Appl Radiol.